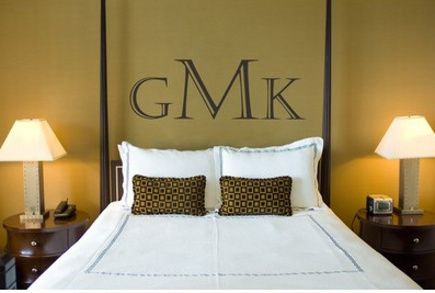 Large-scale bedroom monograms look great on or around a bed and leave no doubt who dwells there. 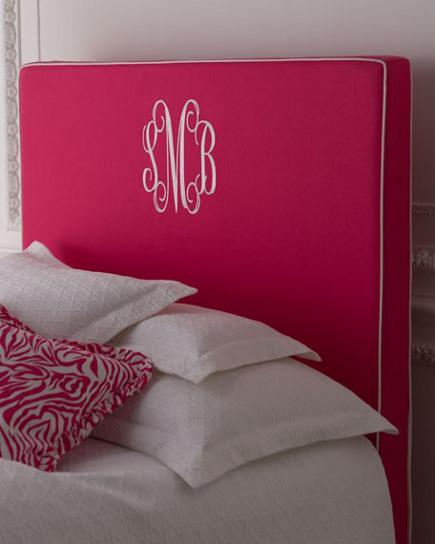 The sly pride in personalization encourages us to consider bedroom monograms which are particularly private spaces. There, the tradition of monogrammed linens — originally done by hand and still highly valued — has been expanded. An upholsterd headboard [top] like Horchow’s “Emporia” offers vibrant color with built-in patterning from the oversized letters. In time, a grand (large scale) monogram should prove less costly than embossing numerous sets of sheets and makes a bolder statement than, say, a blanket cover. With a four-poster and other bed styles, the monogram can be stenciled right on the wall, thanks to Alphabet Garden Decals, about $40. This clever approach to making the room your own stands in for the headboard and has the bonus of working with every possible color scheme. LOVE that one painted on the wall. I would’ve never thought of that, but it’s a great look. Clean and sharp, while personal, too.